"Strong or unshakeable belief in something, especially without proof or evidence." Well, that's asking a lot when it comes to second guessing the stability of any company. So here, as a possible first, we provide the evidence of the financial strength, and therefore stability, of our company. Essential information for your peace of mind, whether you're a potential supplier, or client. So, rather than faith, we think confidence is probably more appropriate. Select from the thumbnails below to view more details. 1. You can simply place your order here on our website by using our intuitive selection boxes (on any of our product pages) and then continue through to your basket page (you'll need to register with us first - see 'Login/Register'. This will then take you through to the secure server of WorldPay, where you can pay your deposit for bespoke pieces, or full payment for accessories. 2. Alternatively, you can email or phone your order through, or visit us personally at our showroom. Click here for contact details. We accept BACS transfer, cheque, credit card or debit card payments. However you want to order, we've made it both straightforward and safe (see our accreditation's below). 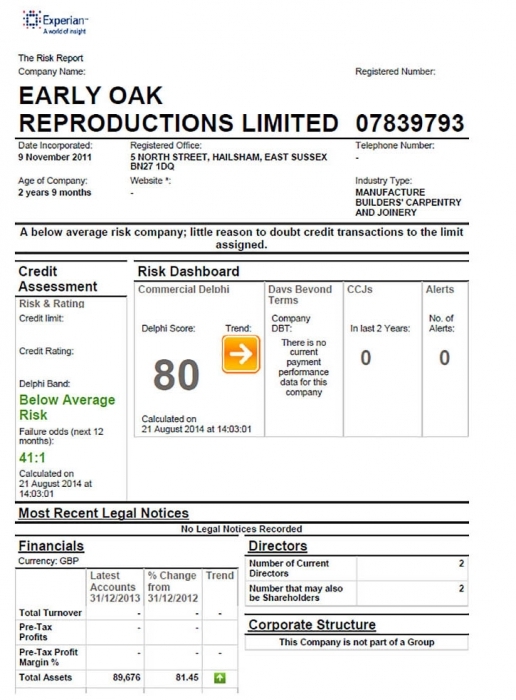 Early Oak Reproductions Ltd, Unit 40, Berwick Court Farm, Alfriston Road, Berwick, Nr. Polegate, East Sussex, BN26 5QS.